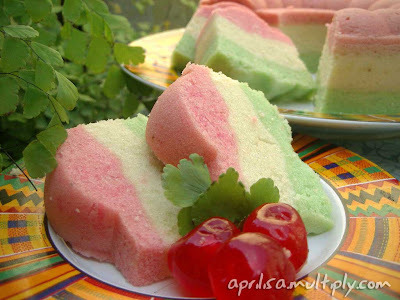 Klepon is a traditional rice cake, popular in Indonesia and Malaysia. It is a boiled rice cake made from glutinous rice powder, stuffed with liquid gula jawa (palm sugar), and rolled in grated coconut. Klepon is green because it is flavored with a paste made from the pandan or dracaena plant whose leaves are used widely in South East Asian cooking. 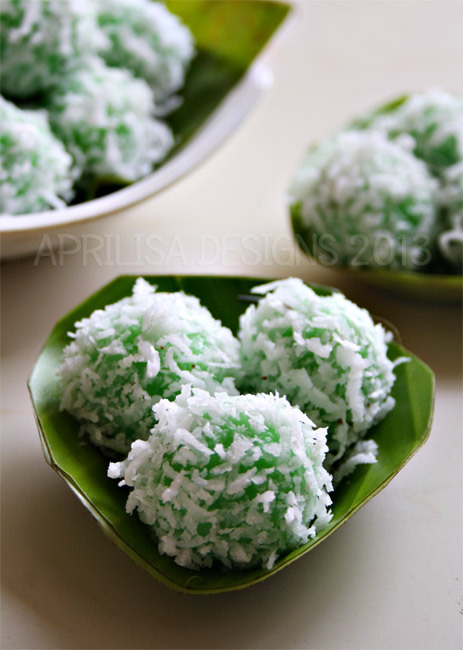 In other parts of Indonesia, such as in Sumatra and in neighboring Malaysia, klepon is called as onde-onde. Place the glutinous rice flour in a mixing bowl and slowly add the water and pandan paste, mixing with your hands. Stop adding water when the dough forms a ball that pulls away from the sides of the bowl but doesn't stick to your hands. Pull off about 1 teaspoon of dough and flatten into a disc. Place about 1/2 teaspoon of sugar in the middle. Fold up the edges and seal completely. Roll into a ball about 2 to 3 cm in diameter with the palms of your hands. Place on an oiled plate. Repeat until all the dough or sugar is finished. Heat a large pot of water until it starts to boil. Prepare a large bowl of cold water. Combine the grated coconut and salt on a plate. Drop the balls one by one into the boiling water, making sure not to overcrowd the pot. When they float to the surface, let them cook for one more minute. It is the most favorite and comforting snack in our home. My mom used to make hem for me when I was a kid, and now I make them for my children. I don't normally use any measurement when I make doughnuts, because I do it often enough to make me remember all the ingredient by heart. Today I'm trying to write down the recipe, but my suggestion is always use your 'feeling' when you try it. The addition of mashed potato will make the doughnuts softer, even until the next day. 1. Wash potatoes, boil them until tender and cooked. Peel off the skin while they still hot, then immediately mash it using potato masher (a fork also works fine). Set aside to cool. 2. In a large bowl, mix together flour, instant yeast, sugar and milk powder, and then add mashed potato and egg yolk. Mix well. 5. Punch the batter to remove the air, then roll in about 1 cm thick. 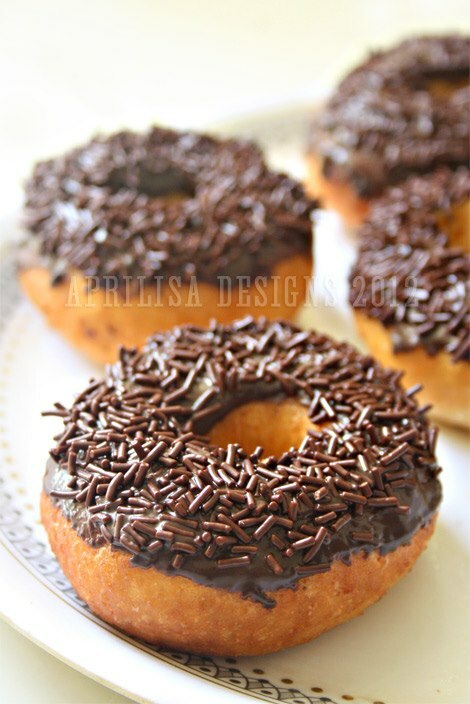 Cut using the doughnut cutter and let stand for another 15 minutes. 6. Heat oil in a skillet over medium heat. Put the dough one by one. Pour the oil over the doughs until get fluffy and cooked. Remove and drain. 7. After the doughnuts completely cooled, you can add the topping or glaze as you like. I start to do my old hobby of baking lately but never thought of continue to document it in this blog, until some friends asked me to. I have my oven back in my kitchen, even though I don't have anymore baking tools collections like I use to have few years back. I'm not planning to bake everyday anyway. So, let's see what I can do. I made this steamed cake a week ago, and then I found out that Miss B from Everybody Eats Well in Flanders is hosting Aspiring Bakers #25 - Steaming Hot Cakes (November 2012). I decided that this could be one of the right reasons to start to write again, LOL. 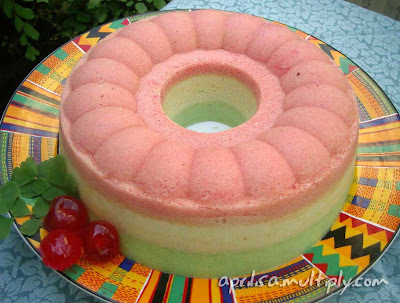 Bolu Sakura (Caramel Steamed Cake) is one of Indonesia's popular steam cake. We can find it in almost every part of Indonesia. This is my first time to make my own Bolu Sakura, and I am really happy with the result. 1. Prepare some small sakura/ flower cake molds, spread with butter/vegetable oil. Set aside. Heat up water in a steamer to boil. Wrap the steamer lid with a cloth napkin. 2. Place 250 grams sugar into a pan and and cook until it turn brown and caramelized. Pour the water gradually, do not stir instantly. Let it cook until boiling then have it a stir. Put a side. 3. Beat eggs, vanilla with the remaining sugar until thick and fluffy. Pour the caramelized sugar while keep beating at low speed until blended. Turn off the mixer. 4. Stir in the sifted-flour until well blended. Add melted butter/margarine gradually, stirring gently with a spatula until well blended. 5. Pour the batter into each mold up to 3/4 full. Steam for 15 minutes until cooked. Take it out from steamer. Let it cool slightly then remove from mold. Serve. 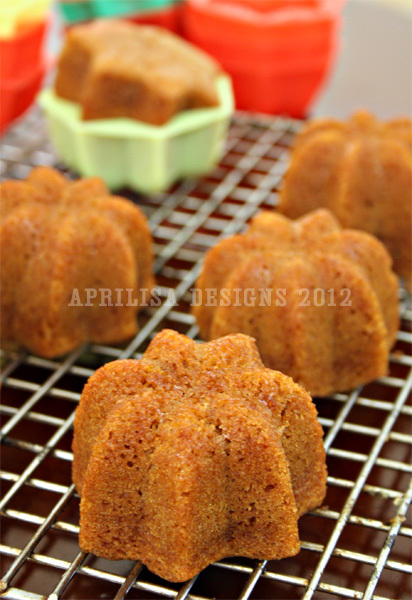 PS: If you don’t have those small molds, you may use a cake/pudding mold (made from plastic). Posted by Lisa on Thursday, August 30, 2007. Enjoy your visit here. And we will visit yours as soon as we get enough change. Posted by Lisa on Friday, June 15, 2007. 50 gram Dark Cooking Chocolate, chopped. 2. In a pan, heat some water. Put butter in a sauce pan (larger than the pan), then place it over the boiling water. When the butter start melting, add chopped cooking chocolate. Mix them until fully melted. Set aside. 3. In a large bowl beat together with an electric mixer : eggs, and sugar on high speed until light and fluffy. 4. Sift together into the batter: flour, cocoa powder and baking soda. Mix well. 6. Pour half of the batter to a greased pan, Place the pan into the steamer. Cover the top of the steamer with a kitchen towel, and place the lid on top; the towel will absorb any steam that collects on top from dripping onto the cake. Steam for about 10 minute on medium flame. 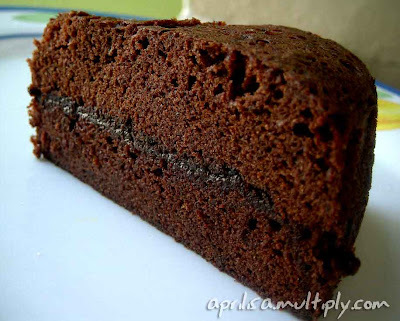 Then add chocolate rice (grated cooking chocolate) over the cake equally. Steam for 5 minutes. 7. Pour the remaining batter and then steam the whole cake for around 20 minutes. This is my Mom's style of Layers Steamed Cake. Layers Steamed Cake is one of many popular snacks in Indonesia. And I love it when my Mother make it. I never make this cake as perfect as she does. I always have a problem with the layer's. It never be flat and smooth.. hahaha. For the colors, red, white and green are always be the favorite. But you can use any other color of course. Brown color of chocolate is often use to replace the red layer. Even if you don't wish to use food color, just leave it. It will not give any differences with the taste. 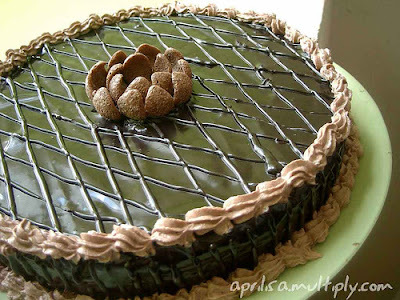 But you will not get the beautiful appearence and good aroma of the cake, of course. This steamed cake doesn't need any butter or margarine. To make it soft, we use coconut milk instead. And if you don't have cake emulsifier in your kitchen, don't worry. Just leave it. You still can make the cake even without it. 2 glasses of thick coconut milk. 1. Arrange a large steamer over boiling water. Make sure it is large enough to hold the baking pan and there is enough water to make a lot of steam. 3. Add the flour and coconut milk alternately in batches. Mix-well with a spatulla. 4. Divide the batter into 3, add each part with avalable food color. Mix well. 5. Pour one color batter to a greased pan, Place the pan into the steamer. Cover the top of the steamer with a kitchen towel, and place the lid on top; the towel will absorb any steam that collects on top from dripping onto the cake. Steam for about 5 minute, then pour over the first layer the next colored batter, and steam for another 5 minutes. 6. Pour the last layer and then steam the whole cake for around 20 - 25 minutes. Yes, I make Adai for our breakfast at home ;-p. I don't want to say that this is the original Adai since I knew this food only after I moved to Cochin. 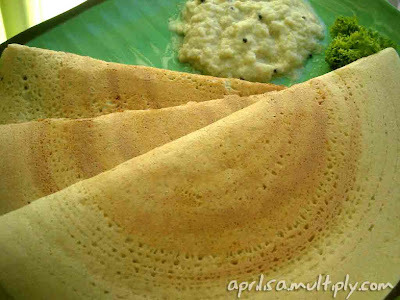 Well actually, I never found Adai in Cochin home for breakfast. Don't know why. The most common daily breakfast here are puttu, idli, dosa and appam. The first time I taste this was when I stayed a couple of days in my brother-in-law's house in Madras. His wife made this delicious breakfast one morning, and we (me and my husband) enjoy it very much. Guess what, Adai is even new for my husband..!!! We called it simply as Dosa. After we had our breakfast, my sister-in-law show me how to make it. She showed me the 4 different dals she use to prepare it. And I found it very easy to make and it doesn't need a fermentation at all. It's a perfect dish for breakfast...! So here it is... The original recipe of Adai (I found out that this is called Adai, after I browse on the internet ;-p) by my sister in law. Soak the grains and pulses for 4 hours or more. Later wash and grind them together by adding a little water. No need to ferment the batter. Add salt and Muringakka leaves. Mix well. To make adai: heat a pan and pour little oil and then pour a ladle of the batter and with a spatula make it to a round shape. Cook only one side. Seve with coconut chutney. Right, another Fried Chicken :-). But this time in different style. American Style. I don't want to claim that this is how americans usually do their fried chicken. I never live in US, though... hahaha. 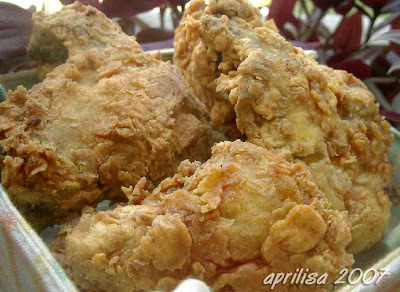 I named this posting American style only because we, Indonesians, first knew about this style of Fried Chicken by the booming of this kind of fast-food restaurants, started with KFC maybe around almost 20 years back. Now we have so many similiar restaurants, including McDonald almost everywhere. As usual, everytime there is a new popular dish in town, people start to try to make the home-made one. After a lot of experiments on so many recipes of KFC style Fried Chicken, finally I can say that this is the best recipe so far. When I posted it in my Indonesian version Blog, there are several friends tried it, and they also satisfied with the result. 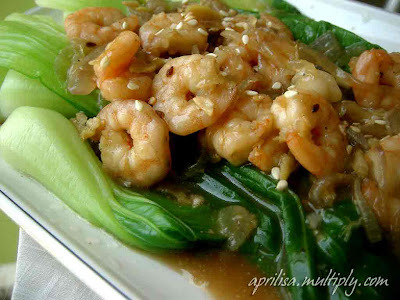 The recipe is taken from Seri Memasak FEMINA magazine. 1. Marinate chicken pieces in lime juice for about 30 minutes. 2. In a pan, heat 1 - 2 tbsp cooking oil, saute ground seasonings paste until fragrance and well cooked. Add in salt and sugar, stir well. 3. Add in chicken pieces, stir well. Cover the pan and cook chicken on low heat until done and the spice are fully absorbed. Remove from the heat and let it cool. 4. In another bowl, mix together the flour, cornstarch, rice flour, baking soda, coriander, nutmeg, salt, chilli powder and pepper. 5. Dip each piece of chicken into eggs white; then roll chicken in flour mixture until covered. Repeat this process once more. Store in an air-tight container. Refrigerate for at least 1 hour. 6. Heat the oil in a large skillet over medium-high heat. Add chicken and fry until golden brown turning both sides as needed. 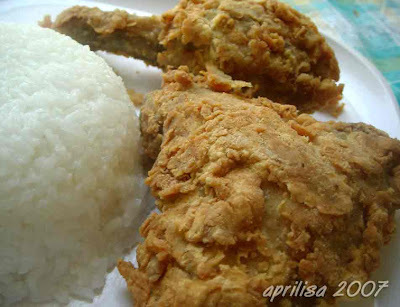 In Indonesia (an also in India) normally people will enjoy this fried chicken as a side dish for rice. 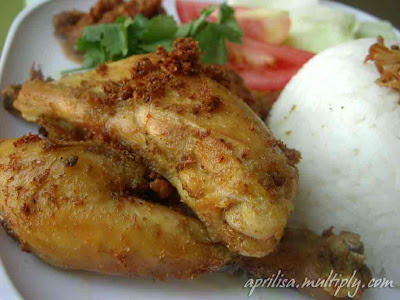 Fast food resstaurants in Indonesia will serve it with Steamed white rice while here in Cochin, they will serve with ghee rice. Of course there will be always another offers like French Fries and bun if you're not wish to eat it with rice. 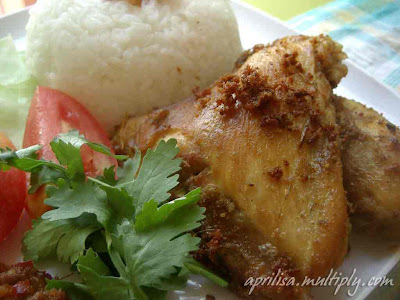 This is the traditional and the most common way of Indonesians preparing Fried Chicken. The main spices used in this style of fried chicken is garlic, ginger, candlenuts, coriander, pepper and of couse turmeric that will gives the yellow colour. You can go with only those spices I mentioned if you cannot find the other spices required in the real recipe. There are two phrase of cooking the chicken. First is simmering the chicken along with the paste-spices and water. And the second one is the deep-frying. The simmering part make the chicken already cooked and tender. We just need a short deep frying to make it dry. 1 piece of lemongrass, take only the white part, and crush it. Marinate the chicken pieces in the pasted-spices for about 1 hour. In a pot, boil the chicken along with the spice paste with low heat. Add salt, lemon grass, salam leaves and water. Cook with a lid until all the water has gone in low heat. Remove from stove and let it cool. Heat enough cooking oil in a pan. Deep fried the cooked chicken pieces until golden yellow. Remove from oil, and drain it with kitchen towel. The best way to enjoy this dish is with hot steamed white rice, accompanied with 'lalap' (fresh raw vegetables : cabbage, cucumber, kemangi leaves, and sliced tomato). And don't forget the hot red chilli Sambal (remember... Sambal not Sambar ;-p). As I wrote in my previous post about Gobi Manchurian, there are some differences in taste between chinese dishes prepared in Indian hotels and the one that I knew in Indonesia. 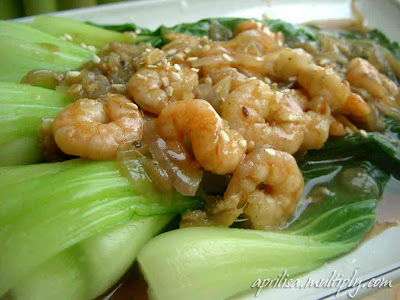 This in one of the most common taste of chinese dishes in Indonesia. You can find it everywhere from home-dinner table to the five stars hotel and restaurants. Last week when I was shopping in one supermarket in Cochin, to my surprise I found Bok Choy on the vegetables racks. Yes, right. That was the first time for me to find it in Cochin for tha last 3 years I live in Cochin. Panicly, I bought all Bok Choy they had... I was so worry I could not find it next time (and it's true. I came to the same supermarket 3 times after that, and never find the same vegetables). So I guess that was my luck and make me able to post this entry. Once I was told by my chinese friend about the main ingredients for making chinese dish you should have. First is of course Soy sauce. If you were in Indonesia, choose the Salty Soy Sauce, as we have another kind of Soy Sauce: Sweet Soy Sauce. The second one is Sesame Oil. This oil have a specific taste and aroma that will make the dish special. In a pan, bring to boil some water and a pinch of salt. Add Bok Choy and cook for 1 minute. Remove from pan and drain it. Put the cooked Bok Choy in a plate, set aside. In a frying pan, heat a little oil. Add minced garlic, Onion and ginger. Stir fry them until the aroma comes. Add prawns and fry until they slightly pink in color. In a bowl, mix together: Oyster sauce, corn flour, salt, black pepper, sesame oil and water. Pour the mixture to the frying pan. Bring to boil and cook until the gravy thicken. remove from pan and pour the sauce over the cooked Bok Choy. Serve hot. Posted by Lisa on Saturday, February 10, 2007. Since I learned to preapre this Upma, it always save me when I'm confused what to prepare for breakfast. 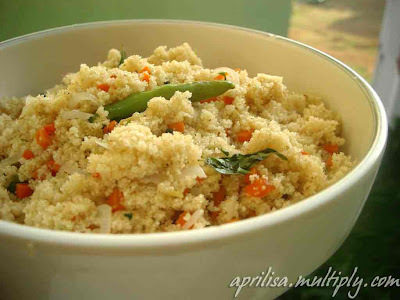 This is the common type of Upma. Dry roast the rava in a pan till it becomes light brown. Keep aside. In another pan, heat ghee and fry the mustard seeds. Add curry leaves, chopped onions, chillies, minced ginger, carrot and coriander leaves to it and fry for 2 - 3 minutes. Add 1 1/2 cups of water and salt. Let it boil. Last, add rava to the boiling water little by little, stirring the water properly. Cook until it is soft and lumpy. 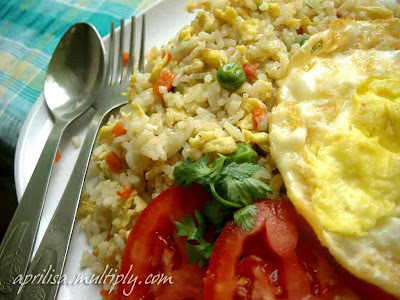 Fried Rice is always be the favourite dish for most Indonesians. It's hardly to find someone who doesn't like it. Since most of us make the dish in urgency hours or whenever we're lazy to cook a complete meal (well, not always like that but mostly.. ;-p), the simpler the method of preparation is the better. Couple days ago I was chatting with my friend in Jakarta right after I had my breakfast. We had an intense conversation (funny, I don't even remember what was the topic ;-p) when finally I feel very hungry and I realize it's almost lunch time..! So this is what she suggest me to get the instant but delicious lunch. The Fried Rice was a perfect one for me. It's simple and easy to make and the taste is excellent. 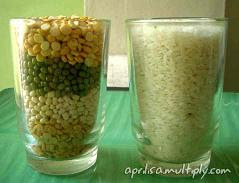 You can add whatever you have in your refrigerator to the rice. Vegetables are always the best choice. 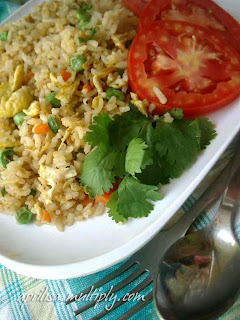 But of course diced chicken, prawns or chooped meatballs will make the fried rice taste more delicious. Try this one. Heat a little oil in a pan, toss garlic until the aroma comes out. Add the beaten eggs and stir fast on high flame follow by vegetables and stir fry them for some times (if you like, no need to over-cooked the vegetables). Add to the mixture salt and white pepper powder, mix well. Then pour in cooked rice, stir all and make sure there is no lumps of rice. Add soy sauce, mix well. Let it cook for few minutes without stirring. Remove from flame and serve hot. I never prepare chicken liver dish in Indian way before. I just didn't know how, cause I found it very rare (never) in Kerala house. One day when I bought one package of chicken livers from nearest supermarket, I decided to give it a shot. So I just browsed around. And you know what, I found only one recipe from Pachakam. The preparation a little bit 'confusing' if you follow the recipes though, hehehehe.... So, just use your feeling. That would be better. And I feel satisfied with the taste... For me, it's perfect with rice, but not with chapati as the recipe's owner suggested. As only two of us in the house who will enjoy it, I adjust the ingredient according to our need and the ingredients available in our kitchen. My husband love it..
Heat 2 tbsp oil over medium heat. Fry the onions and cinnamon, until the onions are soft. Add the potatoes, salt and stir-fry the potatoes for about 2 minutes. Add some water, cover the pan and simmer until the potatoes are tender. Heat the remaining oil over medium heat in a heavy bottomed wide pan. Add the garlic and stir-fry for 30 sec. Add the spice paste, lower the heat and stir fry for about 2 minutes. Add half of the tomatoes, along with some of the juice, stir and cook for further 2-3 minutes, breaking the tomatoes with the spoon. When the mixture is fairly dry, add the liver and adjust heat to medium high. Stir-fry the liver for 3-4 minutes. Add the remaining tomatoes and the juice, stir-fry for 5-6 minutes. Cover the pan and simmer for about 8 minutes. 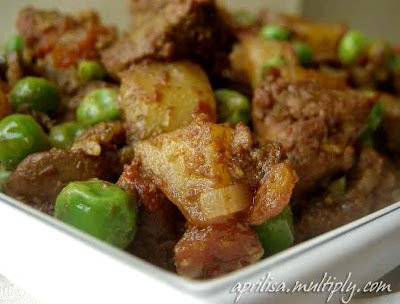 Add the potatoes, green peas, green chillies and the remaining salt and cook for a minute or two. Adjust heat to medium and cook uncovered for further 5 minutes. Stir in the garam masala powder and remove from heat. 1 tbsp ghee or butter. For the stuffing: Mash well the boiled potatoes. Add all the stuffing items to mashed potatoes and mix it properly. Divide the dough into balls of equal portions and. Roll one ball to form of a small puri. Now put a small quantity of above mixture (potatoes) over it, close it from all sides. 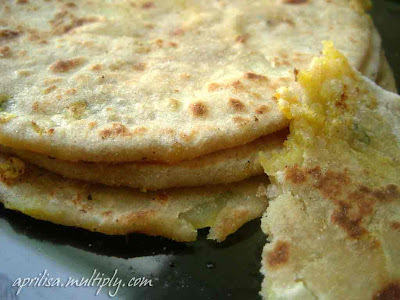 Apply some flour on both sides and roll it gently into a paratha. Heat a flat pan and cook paratha, by applying 1/2 - 1 tsp. oil on each side, until light brown and serve hot. I am Lisa, 34 years old SAHM to 2 little daughters, Nasha and Noura. I'm from Indonesia but currently I'm in Cochin, a small city in South India. This is a place for me to documented what I've tried in my kitchen.